“Four chefs, three courses, and only one chance to win.” If these words bring excitement to your heart and a vision of Ted Allen, you just might be a Chopped fan. If you are like me, you might be feeling a little down because you have finished watching every episode of Chopped on Netflix. Well cheer up and keep reading, because you are about to learn how to play Chopped at home. I am very excited to share with you how my family plays Chopped at home. 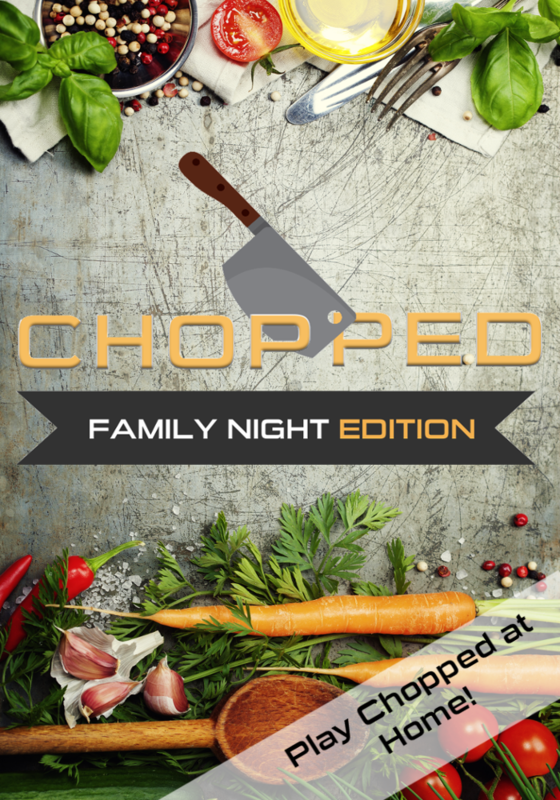 Chopped is not only a great game to play for family night but also great for a couples date night, birthday parties or with your child and their friends, and even for youth group activities. So without further ado, here is everything you will need to know to play Chopped! If you are playing with the suggested 4 teams, (4 teams allows each team to use one burner on the stove) you will need 4 “baskets”. I use cardboard memory boxes purchased at Michaels for about $1.50 on sale, but anything will work as long as you can’t see what is inside. Print off, cut out, and attach Mystery Basket Signs to each basket. Print off the Judge Sheets and cut them into individual strips. Each person will need his or her own judging card, so print off as many sheets as needed. Next, fill each mystery basket with 3 to 4 of the same ingredients. This is where you get to be creative! An example of what I have done in the past for a dessert round is 1-cup cake mix, 1 frozen Go-Gurt, a banana, and ¼ cup chocolate chips. This is also when you need to decide if you will be doing a single round or all three rounds. Don’t feel like you need to do all three, just one round is a lot of fun and it allows for easier set up. If you are doing a single round I suggest the dessert round as we tend to be a lot better putting sweet flavors together then savory. In chopped the contestants also have access to the “pantry”. When I have played with my own family I let anything go within the kitchen. If you are playing with guests, you could set out common ingredients or show them where to access “pantry” items before you begin. Set up 4 stations throughout your kitchen. Don’t worry if you have a smaller kitchen, it can be lots of fun to see the chaos of everyone rushing around in a smaller area. You could also use space on a table if it is near the kitchen. It is up to you what is at the stations. In the past I have included a single pot, a cutting board, knife, baking pan, mixing bowl or two, and access to measuring cups and spoons. Before play I also preheat the oven to 350 and announce which team will use which burner at the stove. To begin the game, you will first split up into 4 teams. If you are short on people your host can always play as well. I find that two per team is best, but you could always play with individuals or different sized teams if young ones need extra help. Have everyone start at their stations and open their mystery baskets at the same time. Start the clock and let the cooking begin! You can adapt the time to your group needs, but I have found that about 20 minutes is pretty good for dessert rounds and a little longer for entrée and main course. Each team will create one plate for judging. Once time has run out, each team will present their dish and everyone will try each dish. 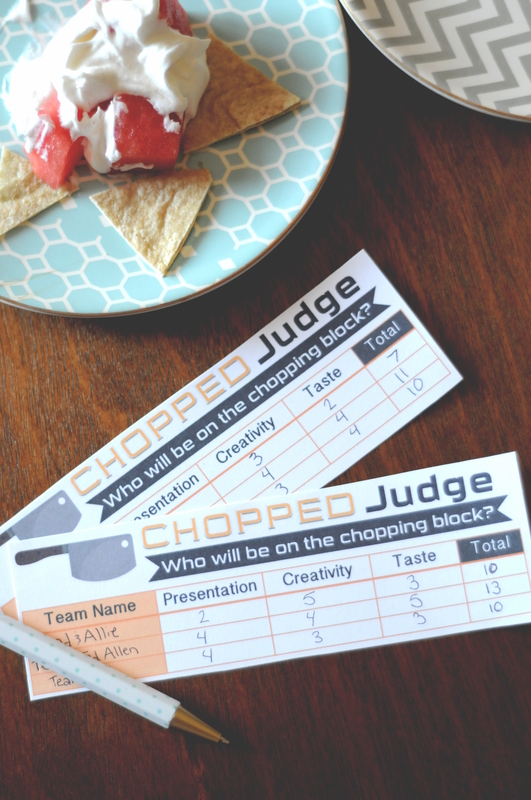 Using the judge cards, score the other teams on their dishes presentation, creativity, and taste on a score of 1 to 5. You will not judge your own team. Add up the totals on every judge card and the team with the highest score wins. This may be the end of your game, or if you are doing multiple rounds repeat the same process with new basket ingredients. You can also decide if everyone continues to the next round or just the two highest scoring teams. And now you know how to play Chopped at home! Also, keep in mind that this game is very adaptable. When I have played it is usually with a family of mostly older children, 14 being the youngest. If you have younger children you could simplify the food options and cooking tools to fit the ages that will be playing. An example might be eliminating the stove and oven. If you are playing with all adults you could include more difficult ingredients and time limits. How ever you adapt the game, just make sure it involves lots of fun! I hope you enjoy! And don’t forget to download your free game printables below. 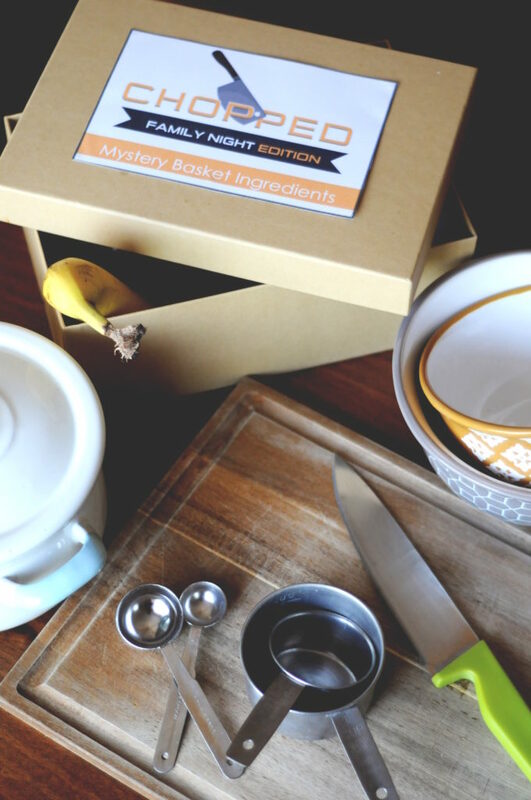 *Do you have any brilliant ideas for mystery basket ingredients? Share them below!